LOOKING FOR SPACE IN A QUIET LOCATION? HOME ESTATE AGENTS are delighted to offer for sale this immaculate and extended four bedroom semi detached property which must be seen to be fully appreciated. Boasting a generous plot & situated at the end of a peaceful Flixton cul de sac. 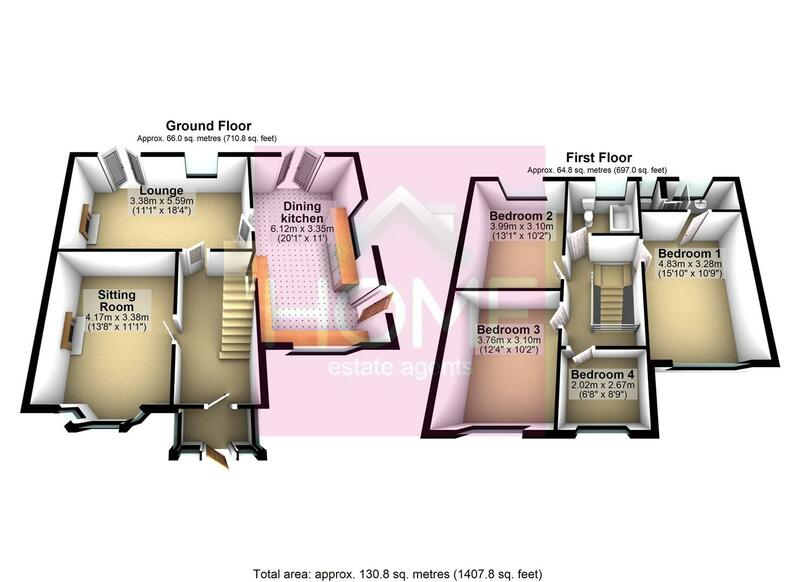 Comprising from porch, hallway, lounge, sitting room, extended kitchen, shaped landing, fitted family bathroom suite and the four bedrooms, one with en-suite wet room. This property has been lovingly modernised by the current owners and must be viewed to appreciate the accommodation that is on offer. Externally to the front there is an impressive block paved driveway which leads to a detached brick built garage. There is the added benefit of a study/home gym located at the rear of the garage. To the is a mainly lawned garden whilst to the rear there is a southerly facing covered patio area with lawned garden beyond. To avoid missing out call HOME on 01617471177. UPVC double glazed door to front with double glazed surround on three sides. UPVC double glazed stained and leaded door to front with double glazed opaque surround. Wall light. Double panel radiator. UPVC double glazed bay window to front with stained and leaded top light. Wooden fire surround with cast iron fire. Television point. Up lights. Double panel radiator. UPVC double glazed stained and leaded window to rear and uPVC double glazed French door to rear. Wooden worktop with brick surround housing an open fire. Television point. Wood effect flooring. Double panel radiator. Fitted with a range of high gloss wall and base units with ra wooden worktop over incorporating one and half bowl sink unit with mixer tap. Plumbed for automatic washing machine and dishwasher. Integrated fridge/freezer. Space for range cooker. Wood effect flooring. uPVC double glazed window to front and double glazed window and door to side. Open balustrade. Single panel radiator. UPVC double glazed window to side and uPVC double glazed stained and leaded window to front. Television point. Loft access. Double panel radiator. Fitted suite comprising, low level WC, vanity sink unit with mixer tap and wall in shower. Tiled to complement. Two uPVC double glazed windows to rear. UPVC double glazed window. Fitted wardrobe with hanging and shelving space. Double panel radiator. UPVC double glazed stained and leaded window to front. Fitted wardrobe with hanging and shelving space and fitted drawers. Double panel radiator. Fitted three piece suite comprising, low level WC, wash hand basin and panelled bath. Tiled splash back. Tiled floor. Tongue and groove to ceiling. Single panel radiator. uPVC double glazed opaque window to rear. Fitted base unit with rolled edge work top incorporating basin. Wood effect flooring. Single unit sink. uPVC double glazed window to side and double glazed door to side. The property is situated on a generous corner plot offering ample off road parking and detached garage along with generous gardens front, side and rear.